Kate Adams Keller, twenty years younger than her husband, was his second wife. She was a tall woman, with blue eyes, and had two daughters (Helen and Mildred) with Captain Keller. She also had a son, Phillips Brooks Keller. Helen, who was Kate's oldest child, suggested the name for her little brother (who was eleven years younger). He was named for Helen's friend, Rev. Phillips Brooks, a noted Boston clergyman (who stood 6' 8" and wrote the lyrics for a familiar Christmas carol - "O Little Town of Bethlehem"). A tall, statuesque blonde with periwinkle blue eyes and a porcelain complexion, Kate was twenty years younger than her husband, Captain Arthur Henley Keller, with whom she had little in common. A friend once bluntly described Captain Keller as "a gentleman farmer who loved to direct rather than work" and "a man of limited ideas and ability." But these lacks seem to have been offset by the fact that he was a raconteur as well as a good-natured, hospitable neighbor who was respected in the community. He was also a hunter, who, as Helen admitted later, "next to his family, loved his dog and his gun." Captain Keller had two grown sons from his first marriage, to Sarah E. Rosser of Memphis, who had died in 1877 at age thirty-eight. Kate got along fairly well with the younger boy, William Simpson, who was a teenager, but she had difficulty coping with James, who was in his early twenties and bitterly resented her. Only nine years older than him, she sensed that he was furious with his father for marrying her only a year after his mother's death. Before her marriage to the captain, Kate had been a Memphis belle who had been pampered and protected by her father, Charles W. Adams, who was a brigadier general in the Confederate Army. But Kate, unlike her husband, was not a dyed-in-the-wool Southerner. Although she seldom mentioned them in the provincial postbellum society of Tuscumbia, she had illustrious northern roots. Her father had been born in Massachusetts and was related to the famous Adams family of New England. Later he moved to Arkansas and fought on the side of the South when the Civil War broke out. Her mother, Lucy Helen Everett, was related to the celebrated New England clergyman and orator Edward Everett, who had spoken on the same platform at Gettysburg with Abraham Lincoln, as well as Edward Everett Hale, the famous author of "The Man Without a Country," which strengthened the Union cause, and to General William Tecumseh Sherman. When the Civil War ended, Kate and her family had moved to Memphis, Tennessee. Marriage at age twenty-two to the forty-two-year-old captain ended Kate's luxurious existence. No longer did she live the carefree life of a pampered southern lady. Instead, this once indulged beauty was plunged into a rugged and primitive existence that was not unlike a pioneer woman's. As she discovered to her dismay, her jovial husband, like most of the southern gentility, during the tumultuous postbellum period, was struggling to make ends meet. Although a member of a distinguished southern family, Captain Keller, a former lawyer, was forced to earn a living both as a cotton plantation owner and as the editor of a weekly local newspaper, the North Alabamian. In 1885 his fortunes had taken an upturn when President Grover Cleveland appointed him U.S. marshal for the Northern District of Alabama. Still money was scarce, and Kate had to raise her own vegetables, fruit, and livestock. There were black servants to help run the plantation, but she did most of her own work, starting at dawn. To further cut down on expenses, she made her own butter, lard, bacon, and ham. She never complained publicly about her husband's shortcomings, attempting to sublimate her regrets about the marriage by becoming an ardent woman suffragist and finding refuge in books and other intellectual pursuits. She also found the time to cook and tend her flower garden, of which she was intensely proud. It was said that she raised the most beautiful roses that people had ever seen outside of a greenhouse. It was also said that she went for days without speaking to her husband. After Helen’s recovery from a severe illness left her without the ability to speak, hear or see, she grew increasingly restless and tyrannical in her parents’ home. While some of her relatives thought Helen was a "monster," others began to recommend that she should be institutionalized. Helen clung to her mother's skirts all day, and Kate's intense suffering was obvious to her friends and family - she had the most sensitive mouth they had ever seen, as if every line of her tragedy were etched upon it. "Fate ambushed the joy in my heart when I was twenty-four and left it dead," Kate once confided to a friend. Kate Keller was in an excruciating position. She had adored the darling Helen who could speak and hear, but after her daughter's defects were confirmed medically, she experienced a bewildering array of emotions: hurt pride, guilt, sadness, and often a wish for the child's death. She felt helpless about how to deal with Helen's destructive behavior. Kate Keller continued to resist the idea of putting Helen away, even though she was getting harder to handle with each day. The Kellers by then had a second child, a girl named Mildred, who was five years younger than her sister. A jealous Helen overturned the cradle. The baby might have died if Kate had not caught her before she fell on the floor. The frustration at not being able to express herself intensified as Helen grew older. Her outbursts increased to the point where they were occurring hourly. The Kellers were mystified. Helen was almost six, and if they could not manage her at this age, when she was still a little girl, how would they handle her when she reached her full growth and sexual maturity? One day, as Kate was cradling her exhausted child in her arms, she remembered a piece she had once read by Charles Dickens, her favorite author. It was about Dickens's own experience of visiting America and meeting Laura Bridgman, an ethereal deaf-blind young woman who had become educated. The solution to Helen's problem, if one existed, might lie with a young woman who had once shared her child's cruel fate. No one was more pleased than Kate Keller when 21-year-old Annie Sullivan became Helen’s teacher. In this 1914 image, we see Kate (on the left) with her daughter (seated opposite) and Annie (who is using a manual alphabet to communicate with Helen). Helen’s mother passed away in 1921, when she was in her 60s. Helen’s father died, in 1896, at the age of 60. 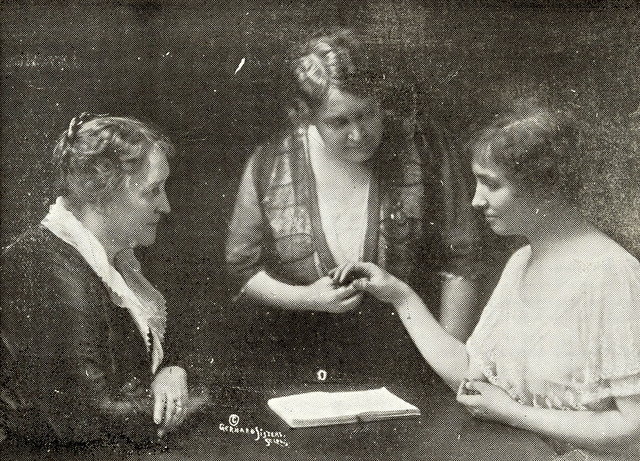 Two hours before Helen Keller and her teacher Anne Sullivan Macy were to appear on a Los Angeles stage in November of 1921; Helen received a telegram from her sister, Mildred Keller Tyson, notifying her of the death of their mother, Kate Adams Keller. Helen was forty-one years old and very close to her mother, as her father, Captain Arthur H. Keller had died suddenly when Helen was only sixteen years old. Several years earlier, Kate Keller had purchased a braille typewriter so that she could write letters directly to her daughter Helen. This really strengthened Helen's appreciation of her mother. Kate Keller had apparently felt her coming death. In March 1920, she had written to Helen of her love, and had promised her daughter that if she were to die, that she would see her in the world to come. Helen outlived her mother by 47 years when she died, at the age of 87, on June 1, 1968. Image online, courtesy AFB (American Foundation for the Blind). Bos, Carole "Kate Adams Keller - Mother of Helen Keller" AwesomeStories.com. Oct 07, 2013. Apr 19, 2019.